Summer brings hot days and cool nights – perfect for outdoor living in Nevada County! As summer warms the rivers and the snow melt slows, leisurely days along the South Yuba are a highlight for adults and children alike. The river is a perfect place to cool after an inspiring hike or mountain bike ride in the lush forests of the Sierras. The most accessible spots are at Edwards Crossing, Purdon Crossing, the 49er bridge or the historic covered bridge at Bridgeport. Numerous lakes including Englebright, Rollins, Scotts Flat, Bowman and Spaulding offer boating, skiing, fishing, and kayaking. Annual Nevada City Bicycle Classic! On Father’s Day each year, the second oldest bicycle race in the country, the Nevada City Classic attracts the nation’s top cyclists including Tour de France and California Amgen winners. For three years the “Reno Rocket” Greg LeMond dominated the race. In 2009, Lance Armstrong, riding with Astana teammates Levi Leipheimer and Chris Horner, stole the show and delighted crowds of over 30,000 people. 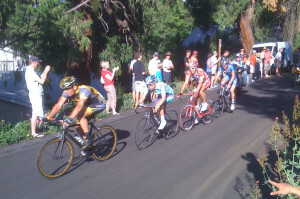 The Nevada City Classic is one of the longest running Pro Am cycling events in the Nation. Juniors compete in male and female races, followed by pro and elite riders soaring loops around downtown Nevada City. 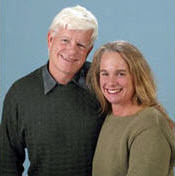 Each year Music in the Mountains hosts its annual Summer Fest at the Amaral Center, Nevada County Fairgrounds. A great way to spend warm summer nights under the stars. Cultivate the art of listening! Special events are also hosted in conjunction with the Music in the Mountains’ Young Composers Project. Nevada City Farmers Market Saturday mornings starting mid-June through late November, share the bounty of community at the Nevada City Farmers Market! and imagination of the participants! For more information visit the website at www.ncderby.com or contact [email protected]. Each year Western Nevada County celebrates July 4 with it hometown parade and fireworks celebration. Even numbered years the parade roles down Broad Street in Nevada City, odd numbered years, join us in downtown Grass Valley for the 4th of July Parade. The parade starts at 2pm in downtown Nevada City or Grass Valley. 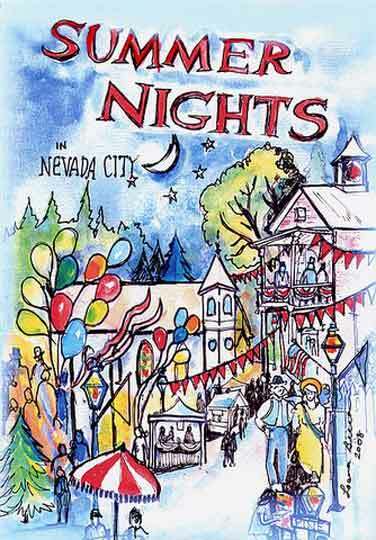 For three Wednesdays in July – Nevada City Summer Nights, Nevada City Summer Nights is a delightful outdoor festival of art and music with local musicians performing on outdoor stages throughout the downtown area. Thursday evenings in July and August don’t miss Grass Valley’s Thursday Night Market. Local farmers line Mill and Main Streets with fresh produce and food products. Artists, merchants and food vendors offer a wide variety of products in downtown stores and on the streets. California World Fest features eight stages of continuous music and dance from around the world. Celebrate mid-summer with us under the cool, tall pines of the Sierra foothills Nevada County Fairgrounds with workshops, international food, fine crafts, and the renowned children’s program. The Nevada County Fairgrounds is a beautiful setting to camp with family and friends during the festival. In mid-August just before school resumes Nevada County hosts its one and only The Nevada County Fair! The LA Times claims it is one of the top 10 County Fair’s in the Country. Enjoy free entertainment all day at five stages throughout the Fairgrounds along with carnival rides and games, barns full of livestock, singers, thrill acts, karaoke, a special events tent with interactive games, magic shows, daily competitions, food contests, and thousands of exhibits. Fun for every one under the cool shade of beautiful towering pines. Nevada City Uncorked, a food and wine event that celebrates the agricultural bounty of Nevada County, takes place on Saturday, August 29 from 1:00 to 4:00 p.m. Uncorked is a walk-about-town style format that includes 20 different venues throughout downtown. Each venue, whether it is a retail shop, restaurant, or winery tasting room, will include wine tasting and food sampling. Annual Sierra Brewfest – an Epic Afternoon of Sun, Suds and Fun – sponsored by Music in the Mountains will feature unlimited tastings from over 30 microbreweries at the Nevada County Fairgrounds in Grass Valley, CA. from 3 to 6:30 pm.